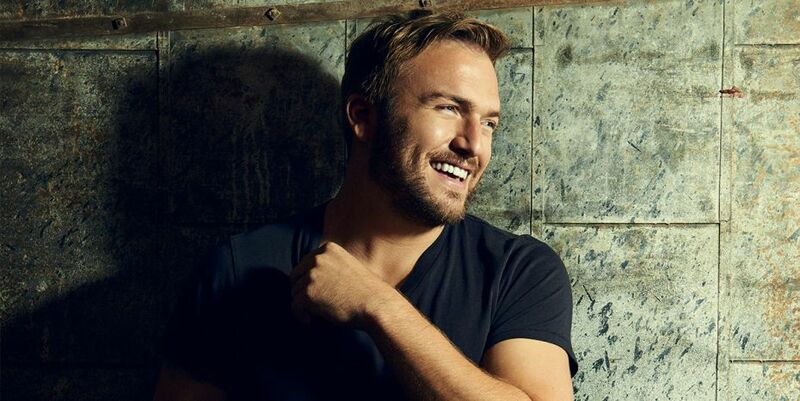 Logan Mize is no stranger to the UK. Having toured with LeAnn Rimes back in 2013 just after the first ever C2C Festival earlier that year in which LeAnn played, Logan also returned to the UK to play the first ever Nashville Meets London show in 2016. Since his UK trips, Logan has built quite the fanbase within the UK and has been asked by fans multiple times to come back. 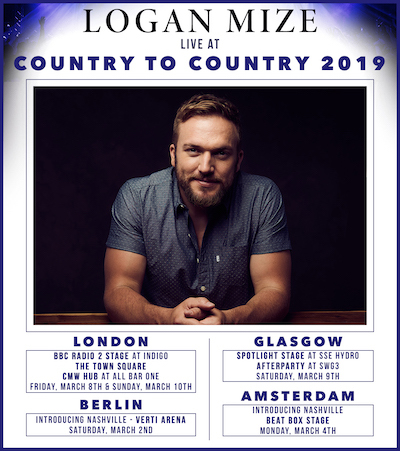 Fans got their wish when Logan was announced as part of this years Country 2 Country Festival line up where he will not only play London but Berlin, Amsterdam and Glasgow too. Logan’s last album Come Back Road was and is still of great success and he even released an acoustic EP featuring acoustic versions of some of the more fan favourite songs off his Come Back Road album. We are so excited to have Logan back in the country next month and we caught up with him to discuss C2C, Better Off Gone, new music and more. Hi Logan – how are you? Last time you were in the UK was for Nashville Meets London how was that? It was really good. It was really fun. The crowd was great and I think that was the first year of the festival. That was my second time over in the UK. My first time, LeAnn Rimes took me over and we did Manchester, Birmingham, London and Glasgow and that was really cool. We will be at C2C in March which we are really looking forward to. Yes we can’t wait to see you there. Your first trip with LeAnn, that must have been pretty great because her audience aren’t all necessarily country fans, so how how were her audience for you? It was a really good crowd, they were so attentive. I could bust out anything and it is crazy how well they listen. It is different in America, you play a country show and everyone is just hammered and yelling and I was just so surprised at how well everyone listens in the UK and appreciates music. It was wonderful. Since we last saw you, you released Come Back Road – tell us a bit about that album and how it has changed you if at all as a musician? It has been so well received. I was coming off the record label, I was on Sony and the new regime there wasn’t really into anything I was doing so I got dropped and started over independently again. I felt like I was starting from scratch again but I knew I had put a really good record together but it was going to take a while to catch on without any major promotion behind it. I put the album out in August in 2017 and basically spent a year trying to get the word out. Now things are really starting to take off from it and we had the single Better Off Gone which hit country radio. We have some really good dates coming in 2019 and some really good stuff is happening so it is kind of a delayed response but it has brought so many great opportunities and fun our way. Would you say being independent has given you more creative freedom to put what you want on the record? Yeah a little bit but at the same time, if I wasn’t in Nashville and worrying about how musically it was going to be received, it would probably be a bit more Americana vocally but I really wanted to be in the country game. I enjoy playing more of a rock show so I definitely wanted to put out something that people liked and not just what I liked so I thought about that a lot and tried to find songs that were universal and relatable and the production of it was really hooky. There is a lot that went into trying to figure out that record and I don’t know if I would have made it any differently if I was on a major label or not. Better Off Gone has done extremely well and has been on Spotifys Viral Top 50 in multiple countries, did you ever expect that? No no, we looked at it and it was like the number one viral song in Switzerland and number two in Norway. It was crazy to see how much reaction that song had had so far. It just keeps moving up on every playlist and it’s great. Yeah, no kidding, I will have to get out over there. You have also put out an acoustics EP…. Yeah, the thing that I noticed with these songs is that the people were really liking the more chilled songs; Cool Girl; Better Off Gone. Those two seemed to be the two that everyone was gravitating towards so I talked to my producer and I was like “Man, let’s do some more acoustic based tracks of these songs” so we decided to make an acoustic EP of the most popular songs of the album. It was been more well received than the album itself. It is cool to have it stripped back and less production. When you do come back to the UK, will it be acoustic or full band? So we are going to be there as a full band for C2C. Going back to Better Off Gone, can you tell us about the writing process behind the song? This is one of the first record where I said to cut out outside songs. The first song that I had written for the album was called Bands Make Her Dance and that was kind of a fun stupid song. Then I wrote Catch a Fish and from there I was hunting for similar songs. I had a certain sound in mind and I heard this song Better Off Gone and I heard Donovan Woods version of it and fell in love with it and thought “Man, I wonder if they would be cool if I cut this?” I heard that Tim McGraw was trying to get a hold of it and I thought “If I don’t cut this, somebody else is going to” so I took it to the studio really quickly, did my version of it and turned it into my label Big Yellow Dog and they loved it! It was almost one of those songs that didn’t make it on there. It was an after thought almost and has become the most popular song on there. You are a father yes? What songs of yours do your kids like best? Gosh that’s a good question. I don’t even know if they like my music or listen to it much haha. There is really old song of mine that is really bad and I put it out when I was maybe 22 years old called American Made and I walked into a room the other day and she had Alexa playing this song American Made and she had a fake guitar strapped on and she was rockin’ out haha. I was terrified, I was thinking “Ah man, if they are going to listen to my music they can at least find the good stuff haha.” I thought I had pulled that entire album off the internet. Maybe my daughter, she is into dance and music and is very theatrical but my son is into sports right now. He likes his drums though. You have been on tour with some great artists, what are your fondest memories and why? Well Keelan Donovan on kast tour and he is so much fun to be around, a great pop artist, he is funny. Dierks Bentley has been great; Gary Allan, LeAnn Rimes. The nicest guy is probably Dierks, he always comes and and watches the show and he introduced himself to my family and he was really gracious and mentioned what songs he liked in the set. We have bullet bourbon, we like that. Maybe some wine, prosecco, granola bars maybe, nothing too interesting. Tell us about being on Hart of Dixie because I loved that show. Oh my gosh, that was fun. Actually I was on the Warner Brothers set recently back where we filmed that and it was the first time I had been back since we filmed that show which was funny. It was really cool because I was just the dude from Nashville in a band and all the actors and stuff want to ask you about being a musician and stuff and It was fun because I was more interested in what it was like to be an actor so it was cool to swap stories. It was cool to see what their work day was like and what the process of making a tv show was like. I loved the experience and I would love to do more in that area. You performed on the show – What song did you guys perform? Well it looked like we performed on the show haha and we won battle of the bands which was in the storyline. I think we played a song called High and Dry. Tell us a little bit about where you are from; Clearwater Kansas. There is about 2000 people maybe? My grandfather started a grocery store there back in the sixties. All my uncles and my dad and cousins worked there. My dad is a butcher. It’s a really good place to grow up and now I have a writing office above the butcher shop and at the back of the grocery store so that is where I write a lot of songs. I was in Nashville for 12 years but now I spend a lot of time back in Kansas which is cool. I can picture it like a real-life Bluebell in Hart of Dixie. Hahaha you know it isn’t the southern thing there, it is more western. It is on prairie so it isn’t probably as charming as Hart of Dixie is haha. I was on the Warner Brothers lot on the town, they did a wonderful job in the middle of L.A making it look like the deep south small town. So I know the vibe you’re talking about haha. Thank you so much for talking today, we can’t wait to see you at C2C. Thanks so much, can’t wait to be there.